It was the summer of 2002 and I was working as an investment banker in midtown Manhattan at Gordian Group, LLC, best known for representing Ben & Jerry’s in their sale to Unilever PLC, when I came up with my fool proof can’t miss get rich quick scheme. Despite the fact that I was very much enjoying being a freshly minted MBA and working in a prestigious boutique bank, I was young enough to dream big and stupid enough to believe that anything was possible. Late one night with my green banker light reflecting off the pane glass window, I penned a historic, to me, letter to Mr. Jack M. Greenberg, CEO of McDonalds. A letter that could have altered life as I knew it. The fact that I am telling you about it here, should make you cognizant of the fact that things did not turn out as planned. At the time of my letter, all was not well in the land of the golden arches. Eric Schlosser had just penned Fast Food Nation and the stock was trading at $30/share on it’s way to $15/share. I, however, was prepared to extend Mr. Greenberg an olive branch, a way to monetize value for shareholders — sell Chipotle Mexican Grill to me, or, if that was not palatable, sell me the rights to open and operate Chipotle in New York City. In the summer of 1999 while interning at a private equity shop in Denver I had discovered Baja Fresh, a Wendy’s property, and due to a previous stint in New York City, I knew the city was ripe for a burrito revolution and that there was not a local property that could service the demand when the wave crested. My real goal was to get the franchise rights for the local territory, but I figured taking the audacious approach would enable me to offer the franchise rights as a compromise assuming we would come to an impasse on valuation. I had tried this stunt before, in 1998, involving Fresh Samantha, a producer and marketer of fresh juice beverages, out of Saco, Maine. Unfortunately, I lost out on the property to Bain Capital, LLC, but I would like to believe my letter catalyzed the process that allowed Bain to buy Fresh Samantha. Neither party ever sent me a thank you note. At the time I was woefully under prepared having no access to capital and no sense on valuation, so it was no surprise that my previous effort failed based on execution, as opposed to ambition. This time around, for my dance with Mr. Greenberg, I was much more prepared. I still had no money but I was armed with numbers. On the capital front, I had left a few messages for folks so I could say, “it’s in process, but I don’t expect a financing contingency in my proposal”. Truth be told my plan was to team up with the founder who still owned a big slug of equity, despite the fact that McDonalds now owned a controlling stake, and he was shurly backable and would not want to see his baby sit in idle while McDonalds focused on fine tuning its strategy oversees (note: I did manage to have a conversation with Steve Ells, the founder, as part of the process and at the time said he had no interest in buying Chipotle back, funny how things would come full circle). What I brought to the table was blind ambition and capital markets relationships. In my effort to prepare for going mono e mono with Mr. Greenberg. I tried to learn how to value franchises. The logical place to start, I assumed, was to look at McDonald’s valuation and understand where the deal would become accretive to them. The problem was, at the time, that Chipotle was accounting for a large percentage of McDonalds’ quarterly earnings. I knew the deal would not be easy on that basis alone. However, McDonalds was trading at 20.0x LTM EPS vs. a historical average of 25.0x. I dug into the numbers and growth rates that we available, looked at public company comp list, circled up a number and fired off my letter to Mr. Greenberg and began to wait. Summer became fall and McDonalds’ stock went in the tank (I was an owner, and still am). I was hopeful for a letter from Mr. Greenberg. I went back to waiting. My magical letter arrived in December 2002, “Mr. Jaffe – If we wanted to sell Chipotle Mexican Grill or partner on an expansion, we would know who to call. You would not be on that list. Sincerely, Mr. JackGreenberg.” Mr. Greenberg lost his job two weeks later. I’m not sure the events are correlated. Chipotle entered the New York City market in 2003, lines were around the block. While I loved the food, I was melancholy about my lost opportunity. On the plus side, I learned a little something about valuing franchise businesses. Below is a summary of points you should consider if faced with the same task. 1) All revenue is not created equal. Spilt the revenue stream into restaurant sales and franchise royalty fees. If you are valuing a large operating business you will focus on profitability, but in a growth equity context looking at revenues is useful. Value the revenues based on their prevailing multiple. Consider that McDonalds is valued at 3.0x, prevailing market comps are trading at a median multiple of 10.7x, with hot properties like Panera bread trading at nearly 24.0x. 2) You need to dig into the franchise contracts to understand the value of the non-controlled entities. Length for contract, contracted value flowing to the parent, supply relationship, and buyback and control provisions all impact where on a valuation range an operation should fall. Longer contracts with more recurring revenue streams is better than less. Discounted buyback provisions are favorable. You should also assess where a franchise is in its useful life if the contract has a rebuild or upgrade provision. This value inures the franchisor, since the franchisee bears the cost but only captures a majority of the benefit, but not all. 3) Analyze location and location density. See Boston Market as what not to do. Did Sydney need 9 locations and Toronto 3? A company that is expanding more rapidly and into markets outside it’s core competency (Krispy Kreme anyone?) should be viewed as riskier investments and the risk should be reflected in the discount rate applied to any cash flow analysis. More highly valued real estate also brings lease pricing risk. If they franchisor owns the land and leases it to the franchisee that has intrinsic value, which translates to a higher multiple. 4) Look at comps. Same store sales. Sequentially. Year over year. Profitability as well. Average sales per store open 12+ months. Are there more winners than losers? Are there outstanding stores and laggards? Are margins compressing, if so why? What are the cap-ex costs relative to its closest peers. Comp restaurant sales growth of 10% is a base line in a favorable economy, high single digits in a more turbulent environment. Higher growth should translate into a better multiple. Average sales per store should be continually improving to command a higher multiple. Restaurant level margins of at least 20% is favorable. Expanding operating income margin, in double digits is good. 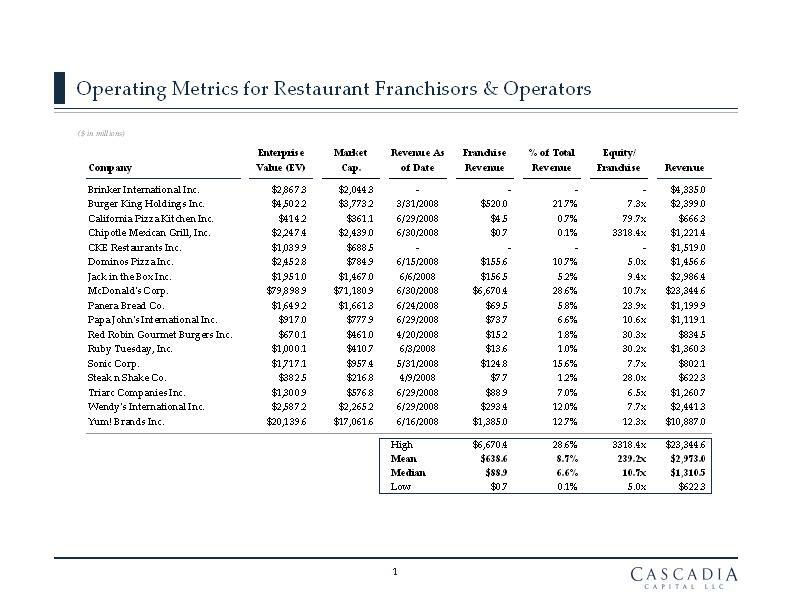 5) Estimate ROI as average sales per store * restaurant level operating margin (total revenue less operating cost divided by total revenue) = restaurant level cash flow. Investment cost per store divided by restaurant level cash flow = ROI. As a baseline 30%+ in favorable economic climates. Net net, Mr. Greenberg put me back in my place. However, unlike my pursuit of Fresh Samantha, I had the valuation nailed. Applying my analysis to Chipotle’s go public numbers got me within $0.25 of the offering price. Now that I have learned a little something, third time is a charm?